Finding the right wedding dress can be hard, but there’s a perfect dress for every body type. Choosing a wedding dress is a difficult decision for every bride-to-be. This one dress has to satisfy all of your adolescent fantasies, while also flattering your figure and fitting in with your wedding day ambiance. With a few tips and tricks, however, everyone can find the dress that’s best for their shape. If you’re pear shaped, you probably tend to carry more weight in your hips and thighs. When choosing a wedding dress, you should look for silhouettes that elongate your figure and show off your curves. One of the best dress shapes for this body type is the A-line dress. Look for one that flares out from the waist, and aim for fabrics that don’t cling tightly to the skin. Taffeta and satin dresses are both great choices. If you are apple shaped, look for a dress that shows off the smallest point of your waistline. A dress with a corset-like bodice will help to create a pleasing silhouette, and V-necked necklines are especially flattering. Also consider a dress with lace detailing or beading. These are often found on dresses that fit snugly in the bodice, which will have a slenderizing effect. If you don’t have a naturally curvy figure, don’t fret. There are many wedding dress silhouettes that can create the illusion of curves. Try a sheath dress in a silky fabric. This will elongate your figure and emphasize your small waist. You should also consider a ball gown with a tightly constructed bodice. This will hide your small hips while creating the illusion of an hourglass silhouette. If you have a small bust line, look for a dress that has beading on the bodice. 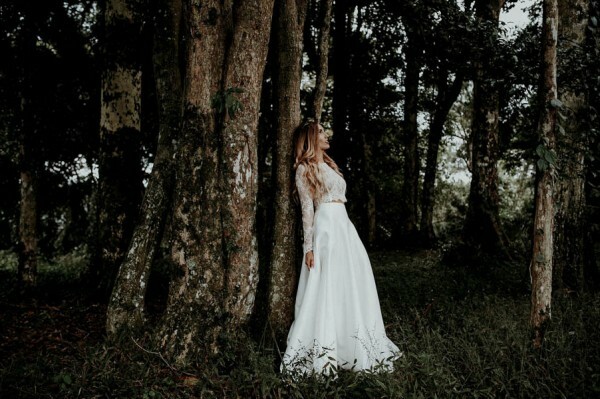 Regardless of your shape, when hunting for the perfect dress in bridal stores in Columbus, every bride should be able to find the perfect dress.